Tag Archives: Social Sciences Dept. 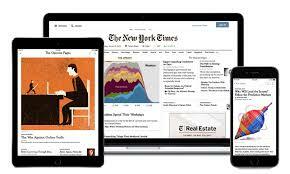 New York Times Online – for FREE! The New York Times Online is available to all GRCC Students, Faculty, and Staff when you sign up with your GRCC email address. NYTimes.com Group Passes are provided by GRCC’s Library & Learning Commons and the Social Sciences Department on a one-year trial. NYTimes.com Group Passes provide free access to the extensive news, multimedia and archives of the New York Times without needing to pay for their own subscription! Click on [CREATE ACCOUNT], then use your GRCC email address to create an com account. OTHER QUESTIONS? Take a look at GRCC’s New York Times Subject Guide, or, call a Reference Librarian at 616-234-3868. Tagged as apps, New York Times, NYTIMES.com, Social Sciences Dept.